Sorry I haven't been around lately - things are happening. Alex and I got jobs in Connecticut, and we're moving in the next few weeks. This is a big move. Alex has lived in Philly for over ten years, and I've been here for five. We're moving out to the country, kind of. I will try to update, but I've barely been home (driving back and forth to CT to look at apartments/have job interviews, etc) and haven't been cooking. But I whipped these up last night, since Alex cooked dinner. You all know how I love brownies, right? Because I do. Love them. Love love love love brownies. Especially warm, with ice cream and caramel sauce on top. 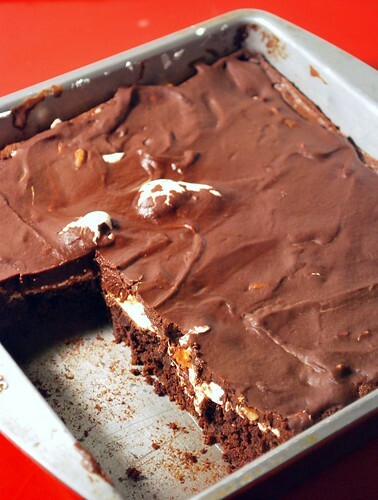 These brownies do not have ice cream or caramel on top, but they're still good. These are what I call deluxe brownies. They are not plain, but have toppings. Toppings of marshmallows and chocolate and nuts. Next time they will have peanut butter. Preheat oven to 350, and grease an 8x8 or 9x9 pan. Melt the butter in the microwave, then stir in the sugar and the cocoa and salt. Stir in the eggs one at a time, then the vanilla, then stir in the flour mix. Beat by hand for a minute or two, then pour the batter into the pan. Bake 30-40 minutes until set. 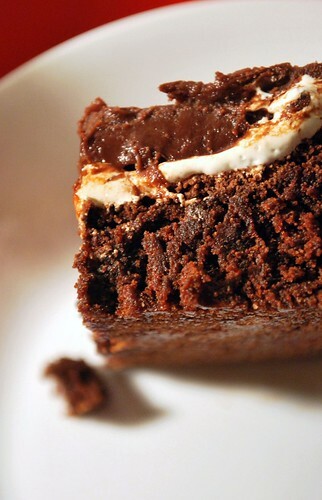 Drop the marshmallows over the top of the brownies, or carefully spread the fluff over. If using fluff, drop spoonfuls on top of the hot brownies and let sit for a minute or two, to melt the fluff, then spread carefully. Sprinkle the nuts on top. Microwave the chocolate, butter and milk together, stirring every 10 seconds or so, until melted. Pour over the marshmallows and nuts. Let cool fully before serving. These look too good to be true! I love your blog- and every single picture/recipe on it! Ooh la la. Looks fab. Do you think this recipe would fare well with egg replacer of some sort? I love your blog ever since I discovered your recipe for 7 layer cookies. As soon as I went GF, I mourned the loss of my favorite holiday tradition and treat. Thanks for letting me enjoy it all over again. Made it this Easter and my family couldn't tell the difference...it's a winner. Plus, I love your flour recipe because it's friendly and easy. Thanks! 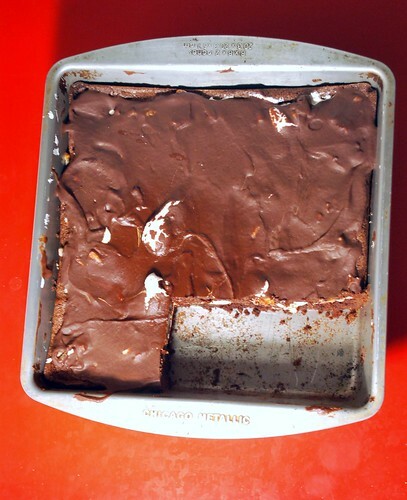 Ohhh my gosh, these brownies RoCk! No one knew they were gluten free...smile! The only thing I did different was I used my own All Purpose Flour Blend. Thanks so much for sharing a wonderful recipe...definately a keeper in our kitchen! Hey, Can I Make This With Regular Flour As Well?